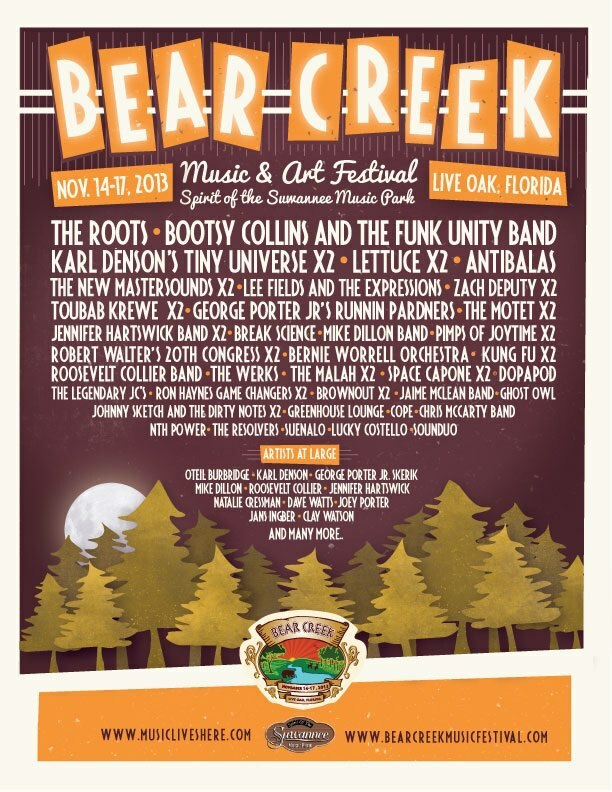 Big IV Productions and Spirit of the Suwannee Music Park have announced the initial lineup for the seventh annual Bear Creek Music & Art Festival taking place November 14th – 17th, 2013. Featuring The Roots, Bootsy Collins and the Funk Unity Band, Karl Denson's Tiny Universe x2, Lettuce x2, The New Mastersounds x2, Antibalas, Lee Fields & The Expressions, Zach Deputy x2, Toubab Krewe x2 and much more, Bear Creek is steeped in the tradition of funk music and the exceptional lineup reflects the eclectic nature of the scene. Returning to its home at the famous Spirit of the Suwannee Music Park in Live Oak, FL, Bear Creek is the ultimate destination for music fans as the summer festival season comes to an end. Festivalgoers can enjoy four days of camping, live music and art at one of the most beautiful live music venues in the country. In addition to primitive camping, fans can upgrade their experience with VIP tickets, RV hook ups, cabin rentals and golf cart rentals. Tickets for Bear Creek Music & Art Festival go on sale on Wednesday, April 24th. To get on the cabin wait list, call Spirit of the Suwannee Music Park at 386.364.1683. Stay tuned for additional artist announcements!